It is still unclear to me whether it’s nature or nurture, but, either way, I love to bake. The argument to be made for nature is clear. I did, after all, choose to spend my college career studying chemistry, a science in which you mix things together in precise quantities and in a very specific order, aiming for consistency of results. The nurture side of the equation also has some logic to it. I have fragrant memories of watching my mom bake cookies, scones, biscotti, cakes, and muffins over the course of my eighteen years at home – maybe years of baking osmosis (get it? once a chemist always a chemist) is finally sinking in. I have grown to enjoy baking complicated, decadent, multi-step desserts that only show themselves on special occasions. These take a lot of work, though, so on every other day of the year, I stick to my mom’s repertoire of tried and true favorites. Along with sticky lemon squares, buttery cappuccino bars, and my favorite raspberry muffins, my strongest memory from her line up is the chocolate chip cookie I’m writing about today. She always called them “my standby chocolate chip cookies,” but I assure you they are much more than that. I’ve renamed them the wordy but descriptive “my mom’s salty chocolate chip oatmeal walnut cookies” so you get the idea of how much love goes into baking them (inspired by my mom) and how many nuggets of yum are in them (salt, chocolate, oatmeal, walnut). Easy to mix, easy to bake, easy to freeze, and easy to please, they found their way into most occasions at our house, at family functions, and at friendly get-togethers. They always sat in a woven basket lined with a pink, orange, blue, and green plaid cloth, and invariably they were gone by the time our company had left the house. This was always a disappointing moment – no more cookies – until I discovered my mom’s secret: always check the freezer. Thereafter, these cookies became our hidden late night snack. My dad and I would sneak into the kitchen long after dinner and pull a couple of frozen cookies from the big zip lock bag, hoping it wouldn’t be too noticeable the next day. (Little did we know my mom was doing the same thing.) To this day, when I make these cookies, I keep some out and put some tucked away in our electric igloo, to be enjoyed over time and late at night. 1. 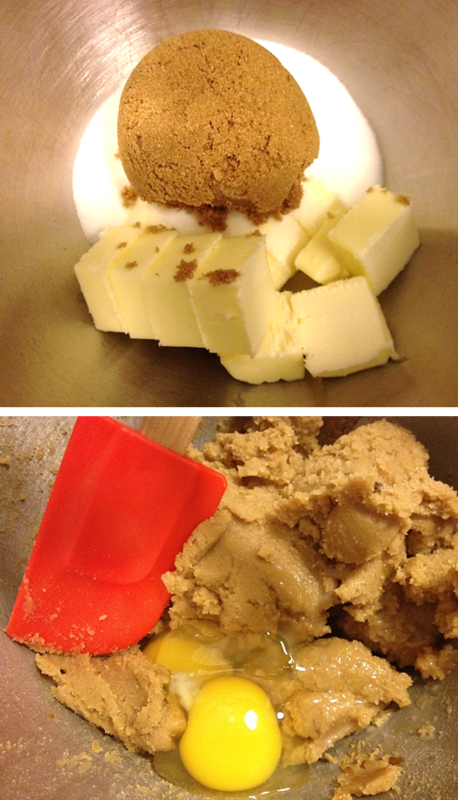 In a stand mixer, beat brown sugar, white sugar, and butter together until smooth and fluffy. 2. Add eggs, milk, and vanilla; mix until uniform. 3. In a separate bowl, combine flour, salt, baking soda, and baking powder. Gradually add dry ingredients into stand mixer, beating until incorporated. 5. Refrigerate batter (ideally overnight, but a couple of hours works too). 7. Once chilled, form batter into ping pong ball-sized balls and place on un-greased baking sheet (I always use a silicon baking mat). Sprinkle sea salt on top of each ball. 8. Bake for 12 minutes. Remove from oven, let cool for 2-3 minutes on baking sheet, then transfer to wire rack. 9. Take a bite…or two…and smile. TIP: for extra batter, roll into balls, place on a cookie sheet, and freeze. Once balls are frozen, transfer them all to a zip lock bag and place back in the freezer. The next time you want cookies, just take out a few balls, let thaw for 10 minutes, and bake! Try substituting 1/4 cup of the flour with 1/4 cup of rice flour. It gives the cookie a slightly different texture sensation without interfering with the taste of this great sweet.